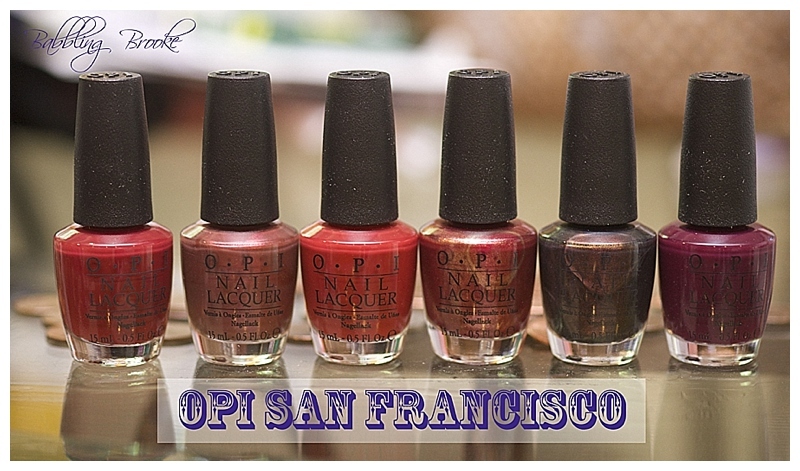 I have been so excited about the OPI San Francisco collection for Fall 2013! Just today it started feeling fall-like to me; it is a bit cooler than it has been, and I've returned to checking my work email daily. Back to school will be here before we know it, and it was perfect that this collection showed up at my doorstep today (of course, it arrived literally five minutes after I finished painting my nails with a pale OPI purple!). 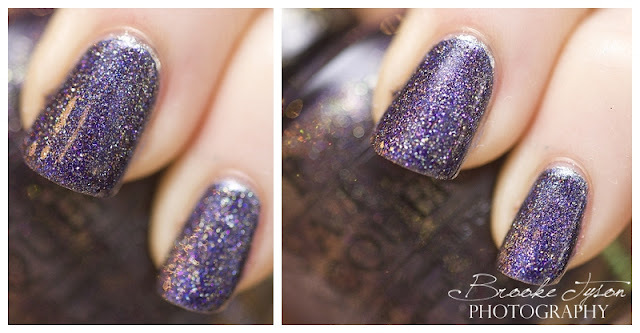 I am also SO excited to share these new swatches with you because I bought a new macro lens! I love it! It is super slow to autofocus though, and manually focusing with wet nails is always a disaster just waiting to happen, so I manually focused and just kept my camera on for the entire swatching time (which as you nail bloggers know is a LONG time!). Luckily my Sony has a great battery, so it worked out just fine. So on to the collection. Enjoy these fun 15!! This is a very pretty red creme! OPI loves their red polishes, and this one does not disappoint. When I think of "nail polish" I always just think of red nails - red nails seem to be the traditional go-to polish color. While I liked this red, I loved Golden Gate more. Well I do love sour dough bread - especially on a fresh mozzarella and tomato sandwich... yumm. Now where was I? So this is a mauve-maroon shimmer that actually covered with one coat (I still used two... old habits die hard!). Adorable name - and so perfect for a bright red creme! This color made me think "paprika" - it is spicy and fun. This and Embarca were my two favorites of the six reds. I was having so much trouble photographing this one; the color just was not right. With that said, I don't love how it looks in the pictures, but in real life, I really loved it. It is a magenta, and my camera just was not getting it. It is sparkly, shimmery, and very pretty, and the formula was great. 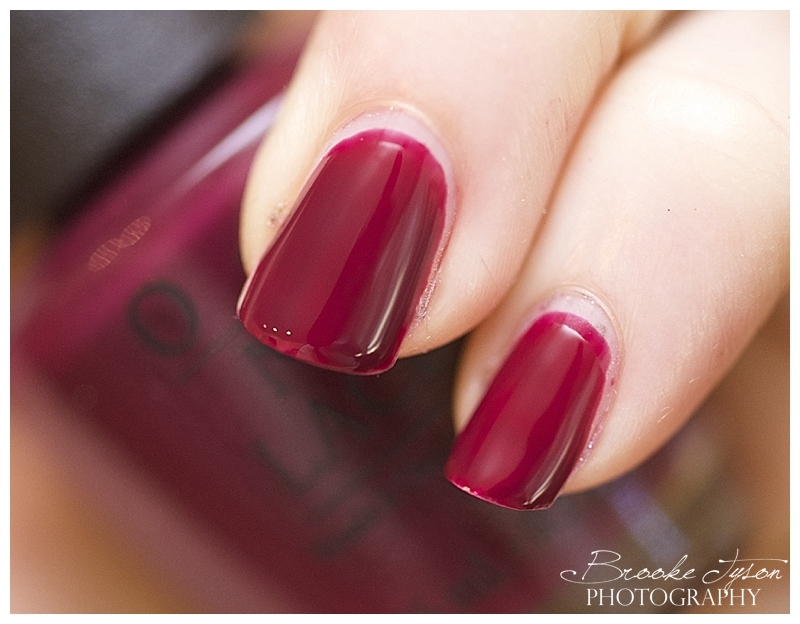 This is a really pretty and unstated burgundy shimmer. My fiance's parents visited the Muir Woods a year and a half ago and they sent us these incredible photographs from their phones. I cannot wait until I make it out there (it is quite a long trip from Maryland, especially when you're afraid of flying) because I would LOVE to photograph those trees. This one was thinner than the others, which gave it a bit of a summery look. I used two coats, and you can see it is still a bit sheer in some areas. It is a lovely shade though; it looks exactly like the sort of color my friend Michelle always loves to wear. Alright - on to the next six shades! I have seriously been excited about this shade since January! It was SNOWING back when I started craving this polish! 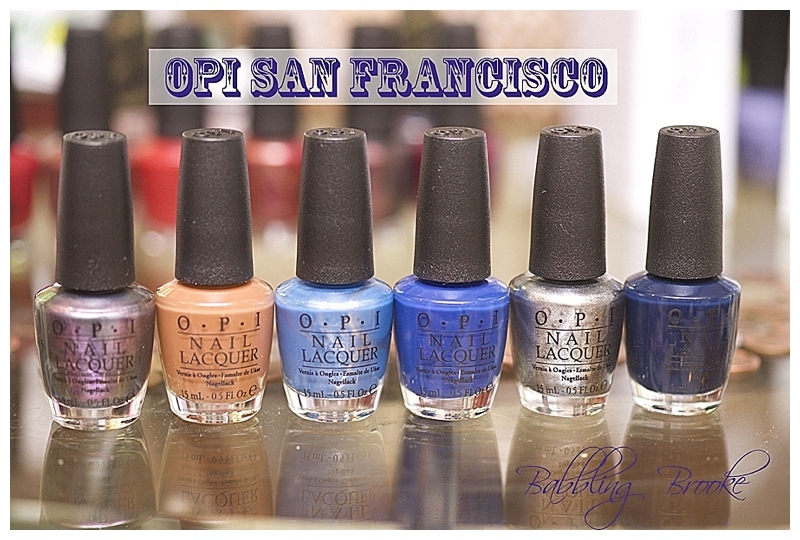 Peace & Love & OPI has, for one, the best name ever, but what this color also has is MULTIPLE colors! I've been a polish lover for many, many years (like 27... wow, I am starting to feel old) and the very first time I ever saw a duochrome polish was in 1999 when a friend gifted me one for my birthday. Let me tell you - I still have that polish. I was fascinated. I could not believe a polish like that existed! 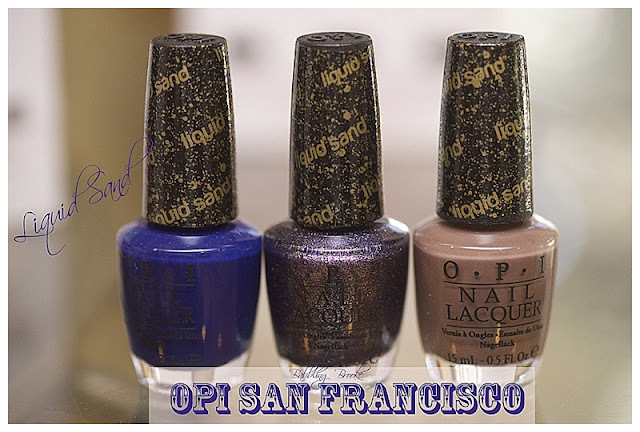 And Peace & Love & OPI is SO much better than any duochrome I own - and here is why: many duochomes are so metallically that you cannot even see the different shade variations - you just get glare. This polish has a great purple and teal variation, with lots of glitter and very little metallic or frost. This is beautiful and so fun. If you don't have a duochrome yet, get yourself this one! This is a nice, warm caramel - YUM!! Seriously - doesn't this shade look JUST like one of those caramels you buy every October? It's like you could just pair this with an apple and have a perfect fall snack. I actually really love this color - and I have nothing like it - that's always exciting!! 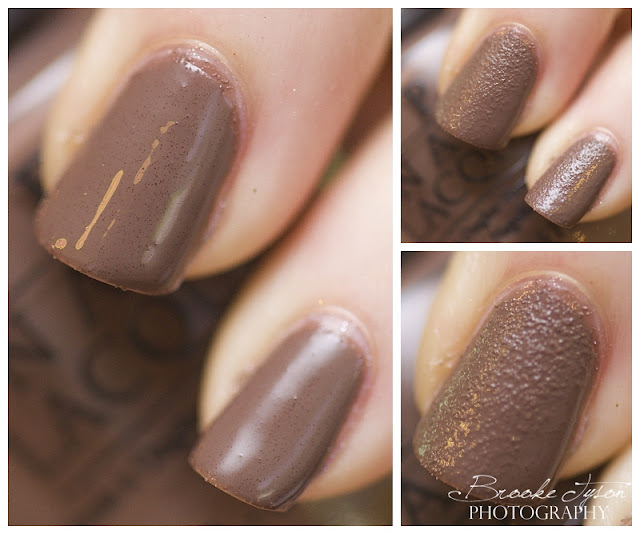 Not only does this caramel look smooth, it went on SO easily and covered perfectly with just one coat. Beautiful blue! Get this one before summer is over. Isn't this a great pool-side shade? (Or hey, a dining al fresco shade?). 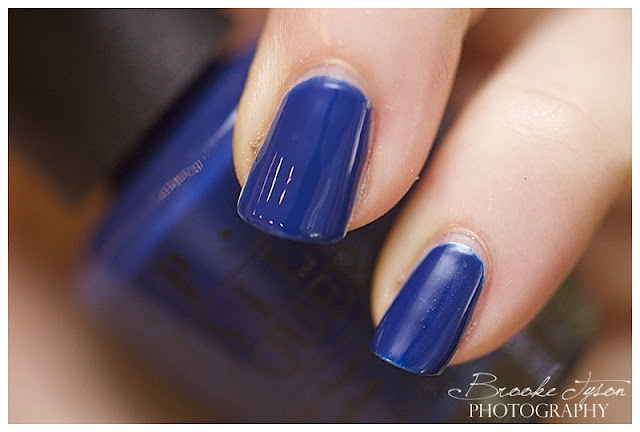 This blue beauty has tons of blue shimmer. I thought it would be a lot frostier than it was, since the bottle has streaks of silver running through it, but it wasn't bad. I plan to pack this one for my upcoming weekend getaway! I love this blue - and I better enjoy it now because I am certain my sister will find a way to make this fabulous blue hers! 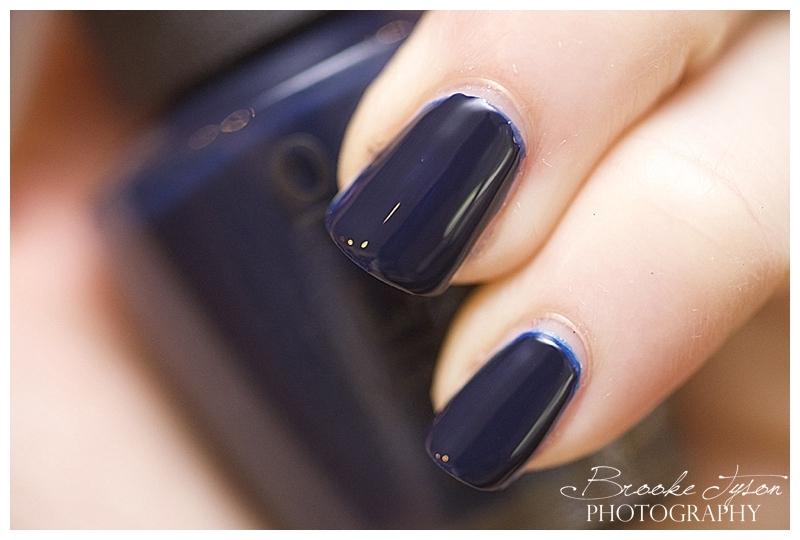 This is a perfect navy blue creme, and my sister is a total sucker for navy blue polishes. I can't wait to wear this one in the fall with a camel colored sweater, although I am pretty sure I will need to visit my sister to use it if I wait until then! Between this and Keeping Suzi at Bay, I prefer the lighter blue, but this is still a nice shade - it depends on your preference. Incognito is very dark (hence the name I guess! ), but dark nails can be awesome. Even OPI doesn't want to take the blame for this one - it's all on you, San Andrea. I should start by talking about the texture finish... I just am not a fan of textured finishes. I know everyone is doing them, but I don't love it. That said, we can correct a texture finish with a great, thick top coat (like Seche Vite). 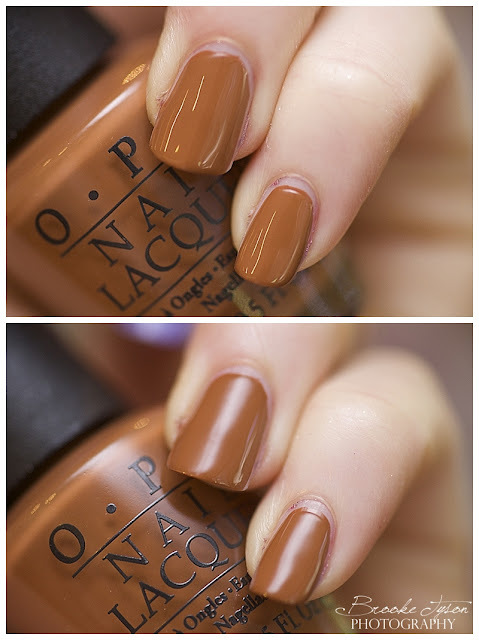 So on the right you can see San Andrea without a top coat, and on the left, the same shade with one coat of top coat (this is an OPI top coat pictured). This bumpy brown could be cool for Halloween, ocean-themed nails, or a day of archeology, but otherwise, I like it way better with the top coat - smooth and kind of speckled. Ok, this name did give me a chuckle (but hey, I love dogs). 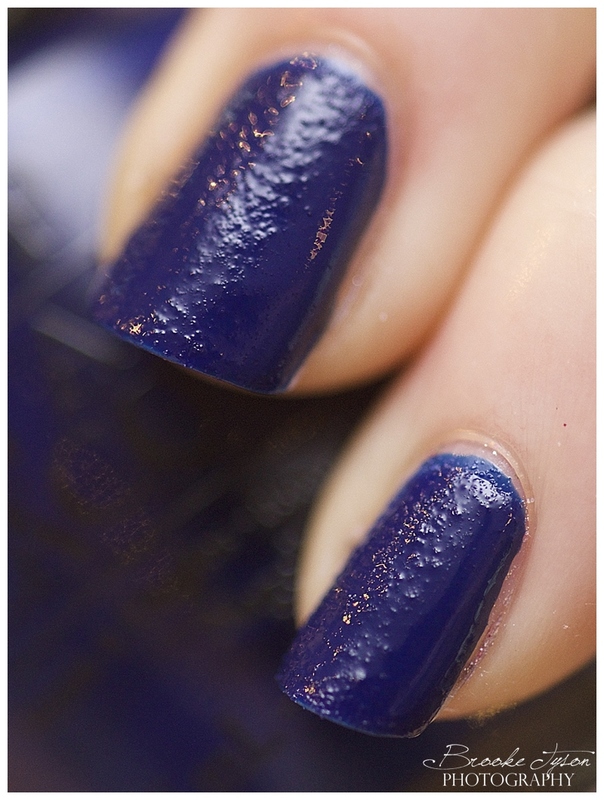 This dark blue is a gorgeous shade, but again, I don't like the texture. I should have tried it with a top coat, because I really think I would have loved it then. I encourage you to check out Vampy Varnish's post on the San Francisco collection; she is from San Francisco and has some great pictures of the area! All of these shades applied nicely and the formula was great. I am so excited about this collection and I hope you are too! I would love to know which ones you can't wait to try. Visit OPI.com to learn more, and find these now at reputable retailers, such as ULTA and Sephora, or your local nail salon. AHH! I got a shout-out! and you are so right! I was going to tell you I love that color so I read more. so funny. I also don't like the textured. I saw this "sugar finish" yesterday in the drug store actually and thought - it just looks like you messed up. I guess if you are a person that frequently messes up your nails this could be a good option? Babbling Brooke's 5th Anniversary GIVEAWAY! !